In an international career spanning more than 20 years, Sarah has won 11 gold, eight silver and three bronze medals across six Paralympic Games. 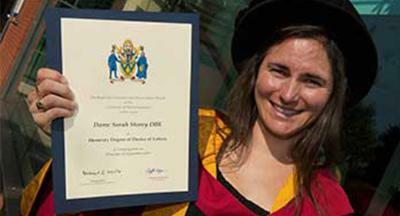 Great Britain’s most decorated female Paralympian was conferred with an Honorary Degree of Doctor of Letters from the University’s Faculty of Education, Health and Wellbeing at a ceremony at the Grand Theatre in Wolverhampton on Thursday (September 11). The award recognises her outstanding contribution to sport and sport education. 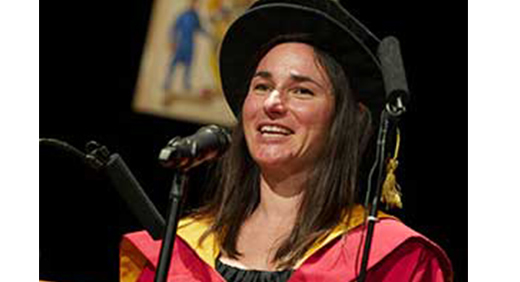 Sarah was a visiting lecturer at the University’s Walsall Campus in 1997/8, during the period when she was an elite Paralympic swimmer, and she spoke to students about adapted PE. During her speech at the Grand Theatre, Dame Sarah said she was “delighted and honoured” to be able to share the day with the graduates. She added: “As an athlete, I was not always the most skilful person but it was the hard work I put into my sport that has helped me to reap the rewards I have gained. Sarah is one of the most versatile athletes in the world having won World and Paralympic gold medals for her country across both cycling and swimming, comprising 11 different events. At London 2012, she topped the medal table for the British team with four gold medals from four events, and set a new World Record in the C5 women’s 3,000m individual pursuit. Having competed for the Great Britain Para-Swimming team from 1992 until 2005, Sarah found her second sport of cycling almost by accident, having been forced out of the water and onto the bike for much of 2005 with a series of ear infections. Sarah was made a Dame in the 2013 New Year’s Honours list, ahead of a short break for the birth of her first child, Louisa. Not even that could stop her as she came back with force to take two gold and one bronze medal at the 2014 World Track Championships. For more information please contact the Media Relations Office on 01902 322736.